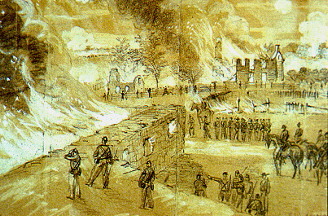 During the battle, the Confederates burnt Samuel Mumma's farmhouse, springhouse, and barn to prevent them from being used by Union Sharpshooters. This on-the-spot sketch was done by the Englishmen Alfred Waud. Writing churns things up. That churning is one of the most fantastic things about writing, one of the things I love, but it’s not comfortable. Facing things, really looking at things, staring dumbly at things, that kind of minute and honest reflection, can be difficult and unpleasant. You can also find small treasures there. In working on an essay about stuff (literal stuff, the items that tumble from my closet, the towers of papers and important detritus spanning my surfaces) I realized I actually need to be writing about my phantom limb: my childhood house that’s no longer there. It was burned down in a fire training exercise. I’ve written about it in my novel, immortalized it here and there. This time I decided to write a short story about the house, about a ghost in the house, about the fire…currently, the stuff of the story is a huge mess, but it’s been satisfying to make. Right now I’m just generating words, ideas, the raw junk that I will attempt to shape into a story. It’s all I want to do, but it’s so untidy, so simultaneously new and ancient. Like my surfaces, it’s cluttered, noisy. This entry was posted in Uncategorized and tagged de-junking, house fires, Interdisciplinary Aesthetics, phantom limbs, The Watery Girl, writing. Bookmark the permalink. It’s interesting that you should write about fire on the 27th. I spent that day remembering and anticipating that the next day would be the 34th anniversary of the Beverly Hills Supper Club Fire in Southgate, KY. A common childhood memory – fire – that carries with it such different experiences for us. Interesting. I didn’t recall about that fire but looked it up online. It sounds truly horrific.